Working with color is one of the things I love about crochet – the options are endless. You can create contrast with bright colors, a soothing palette of pastel colors, or a gradient look by using varying colors of the same color family. How you use color is one way to express your creativity. In this chapter we’ll learn basic color theory and I’ll share some tips about choosing the colors for your projects. This image illustrates the color wheel used by artists and illustrators. are colors are the base for all colors in the spectrum. Primary colors are called “primary” because they are not created by mixing colors and include blue, red, and yellow. are a mixture of two primary colors. They include orange, violet, and green. Orange is a mixture of red and yellow. Violet is a mixture of blue and red. Green is a mixture of yellow and blue. are a mixture of primary and secondary colors. These include yellow orange, red orange, red violet, blue violet, blue green, and yellow green. There are colors between the three main categories and the shades, tints, and hues can be an endless combination of colors. Adding white to a color creates a lighter tint, while adding black or gray creates a darker shade. White and black are usually considered neutral as well as gray. White is actually all of the colors in the spectrum, while black is the absence of color. This may sound counterintuitive, but we see color when the colors in the light spectrum are absorbed by a material. White absorbs all the colors so our eyes see it as white. Black material rejects, or bounces back, the colors of the light spectrum, so we see these materials as black. Now if you are mixing paints you know that if you mix all the colors together you get a muddy black, but as far as the light spectrum and what makes colors appear as they do, black is actually the absence of color. This information really isn’t important for the crochet artist, but it is fun knowing these facts if color theory is something that interests you. Colors are normally categorized into two main types; warm and cool. If you look at the color wheel you can see where the colors change from warm to cool and this divides the color wheel almost exactly in half. Warm colors include orange reds, browns, gold, orange, orange yellows, and yellow greens. Warm colors tend to create a calm and soothing color scheme. Cool colors include violet, violet reds, blue, blue greens, and silver. Cool colors create an energetic and vibrant color scheme. Black, white, and gray are considered temperature neutral and can be used in combination with warm and cool colors. How you use color will determine the look of your project, and the feeling the colors evoke. Color has very strong psychological impact and there have been several studies about the effect color has on people. As a crochet artist it is good to know the “rules”, but feel free to break them. Some of the prettiest projects I’ve seen use all sorts of colors ignoring all of the traditional color scheme rules. Use the information in this section as guidelines, but don’t be afraid to experiment and combine whatever colors you like. A contrasting color scheme uses colors on the opposite side of the color wheel. If you look at the color wheel you will see that red is opposite of green, orange is opposite of blue, and yellow is opposite of violet and are known as contrasting colors. You can also use secondary and tertiary colors to compliment your main color selections. When paired with black or navy blue, contrasting color schemes are especially bright and vibrant. An analogous color scheme uses colors right next to one another on the color wheel. Usually the colors are in the same color family such as green, green blue, and blue. You can also use different shades of these colors to create a very pretty and rich looking project. One option is to use analogous colors as a gradient going from light to dark, or dark to light. This effect can be really stunning in a project if the light color is very light and the dark color is very dark. A triadic color scheme uses colors which form a triangle on the color wheel. If you look at the color wheel in the image above you will see an example of a triadic color scheme would be orange, green, and violet. Another example would be the main primary colors of red, blue, and yellow. The tetradic, or rectangular, color scheme uses two sets of contrasting colors for a very vibrant color combination. For example, orange and blue paired with violet and yellow. If you connect these colors with lines, they form a rectangle. When using a tetradic color scheme it is a good idea to choose one color as the dominate color and be aware of the combination of cool and warm colors if you want a particular color temperature in your project. The square color scheme is very similar to the tetradic. The colors in a square color scheme are evenly spaced to form a square when connected with lines. An example of a square color scheme is green, yellow orange, red, and blue violet. This color scheme can also be very vibrant, or soothing depending on the shades and tints you choose. Scrapghan with lots of colors! The information I shared in this chapter should be seen as guidelines. Color choice is very personal, so don’t feel bound by the different explanations of color schemes and color families. If you like a color theme, use it. That being said, here are some tips for choosing the right colors for your projects. Decide if you want a color scheme which is soothing or vibrant. This will help you choose colors which either contrast each other, or are from the same color family. Do you want your colors to be cool or warm? Cool colors have more blue in them while warm colors tend to have more orange or yellow. For example, violet red is a cool color, while red orange is a warm color. Choose a neutral color to compliment the color scheme. Neutrals include white, black, gray, and sometimes brown. Look to nature for inspiration. What are the colors in your favorite flower? Is there a landscape you are fond of? Inspiration can be found in many places so keep your eye out for any color combinations which speak to you. Choose colors which make you happy. In the end your color choices are your own, so use the colors you like and that make you happy with your project. Be bold and daring…throw the rules out the window and experiment! Using color in crochet is fun, and it is very easy. There are no hard techniques to learn, and if you know the basic color changing techniques you will be on your way to learning more advanced techniques we’ll cover in a later chapter. In this chapter we’ll go over the way to change colors at the beginning of a row, how to carry colors up a row or a round of crochet, and how to change colors in the middle of a row or round. You will need to know the basic crochet stitches and techniques before you begin this chapter, but if you know how to single crochet, double crochet, how to chain stitch, crochet in the round, and how to weave in tails you’re ready to get started working with color techniques. Changing colors at the beginning or end of a row is very simple. Work the last stitch of the row until you have two loops on the hook. Drop the old color and pull the new color through the last two loops on the hook. Continue to work with the new color and catch the old color in the first chain stitch of the next row to secure it. If you are going to be using the same colors during your project, you may want to carry the colors up the side of your project. This cuts down on the number of tails you have to weave in, and creates a strong stable crochet fabric. You can also use this technique and carry colors on the inside of a crochet in the round project, such as a hat. When you change colors catch the old color in the first chain stitch of the new row. Work the new color across the row and when you work back across the row, you can either change colors again, or catch the old color under the first chain stitch of the new row. This carries the old color up the row without having to fasten it off. Work the last stitch to the last two loops on the hook. Pull the new color through these loops to complete the stitch. Catch the old color under the first chain stitch of the new row to carry it up the side of the project (you can also use the same technique when crocheting in the round on the inside of the project). Changing colors mid-row or round is just as easy. Work the last stitch of the old color until you have two loops on the hook. Drop the old color and pull the new color through these two loops. When you work the first stitch of the new color, catch the old color under the new color on the wrong side of the fabric. This secures the color and hides the color change. When you work your way back across the row and need to change back to the first color, simply repeat the process. This technique is used in Intarsia crochet and many other color techniques. We will cover these techniques in a later chapter. Work the last stitch of the old color until you have two loops on the hook. Pull the new color through the last two loops. Secure the old color under the first stitch of the new color on the wrong side of the fabric and continue with the new color letting the old color rest there. There are times when you won’t be able to, or you don’t want to, change colors by pulling the new color through the last two loops of the last stitch. For example, when you begin a new round of color on a Granny Square you won’t be pulling the new color through the last stitch. Instead make a slip knot and place it on your hook. Insert the hook into the stitch where you want the new color to begin, yarn over and pull the yarn through the slip knot. This attaches or “joins” the new color. Now you can proceed with the pattern as usual. You can also pull the new color through the very last round. Work the last stitch and insert the hook into the last stitch and pull the new color through the slip stitch to end the row. Carry the colors up the inside of the round by catching the old color under the first chain stitch of the new round. The Intarsia color technique is used to create pictures in crochet. It is a fun technique and opens up all sorts of project possibilities. As you work across the row you change colors and leave the old color rest in the row until you work back to it on the next row. This means that for each color change you will need a separate bobbin of yarn. You can purchase plastic bobbins, or use small pieces of cardboard or heavy paper to wind up the yarn you need. Look at your pattern and see which row has the most color changes. Count up the colors and the times you need to change them and wind up your bobbins accordingly. For example, if you need to change a color three times, then you will need three bobbins of that one color. Before we begin to actually crochet an example let’s look at an Intarsia chart. Charts are read from the bottom up starting in the right hand bottom corners. They are read exactly as you crochet them with odd rows read from right to left, and even rows read from left to right. Each square on a chart represents a stitch. You can use single, half double, and double crochet stitches for an Intarsia project. You will use the same stitches throughout the project so keep that in mind when choosing which stitch you want to use. Also the stitches you choose will affect the finished size of the project, so you may want to work up a quick gauge swatch in each stitch to see how it affect the size. The foundation chain is not usually represented in a chart. Count up the stitches across the row and then add the appropriate number for the first stitch. For example, in the following chart for a simple diamond shape there are 9 stitches across the row. If you’re using double crochet, then you would chain 9 plus 3 for the first stitch. In this chart you can see there are only 3 color changes on all rows except for the first and last row. This means you need to wind up 2 bobbins of white, and 1 bobbin of blue. Begin by reading Row 1 from right to left and work 9 white double crochet stitches (the plus 3 counts as the first stitch). Row 2 is read from left to right. Work 4 white stitches, 1 blue stitch, and 4 white stitches dropping the old color and picking up the new colors as you work across the row. Row 3 is read from right to left. Work 3 white, 3 blue, 3 white. Row 4 is read from left to right. Work 2 white, 5 blue, 2 white. Row 5 is read from right to left. Work 1 white, 7 blue, 1 white. Row 6 is read from left to right. Work 2 white, 5 blue, 2 white. Row 7 is read from right to left. Work 3 white, 3 blue, 3 white. Row 8 is read from left to right. Work 4 white, 1 blue, 4 white. Row 9 is read from right to left and finishes with 9 white. Fasten off and weave in the tails. Keep the yarn in the back of your work as you work across the rows and change colors. This will leave it in the correct position when you work the next row. When you change colors in Intarsia you will notice there is a strand of yarn in the front of your work. To hide this strand, catch it under the first stitch of the new color. If you’ve pulled the yarn across more than a couple of stitches, you may have to catch this strand under two stitches to hide it. This creates a cleaner more polished look to your color changes. Many times color changes in Intarsia look almost pixilated. This is normal because of the way the crochet stitches are constructed. If you want a very clean look, you can use yarn to embroidery around the shapes, or you can surface crochet over the edges of the design. Be sure to take a few steps back and look at your design before you decide if you like it or not. Remember the design is to be seen as a whole from a bit of a distance, not up close like when you are crocheting. Here is the finished pattern worked in double crochet and single crochet stitches. Note the difference in the sizes between the two examples. Also single crochet gives you a cleaner look than double crochet, but either stitch is acceptable, as well as half double crochet. Experiment with the different stitches to see which effect you like best. Fair Isle is used to create simple or intricate designs in crochet. You may be familiar with the term Fair Isle used in knitting. Well you can use the same technique in crochet with very pretty results. Fair Isle patterns are usually charts and are read just like Intarsia charts. Instead of using yarn bobbins, the yarn is stranded across the wrong side of the fabric. Fair Isle crochet is usually used for hats, garments, or other projects where the wrong side is not readily visible. As you change colors in Fair Isle you will carry both colors along the row on the wrong side. Work a complete stitch and then pick up the new color and work a complete stitch. As you pick up and work with a color, catch the other color under the stitches to carry it along the wrong side of the work. This creates strands of yarn on the wrong side, and a pattern on the right side. This is the chart you would use if you wanted to use this Fair Isle pattern. Since you are crocheting in the round the chart is read from right to left for all rows. Usually Fair Isle is not worked in rows since the yarn is stranded on the wrong side and would be visible. The chart is actually a section of the pattern repeat. Work the stitches across the row and then go back to the beginning of the row and work them again as many times as needed to complete the round. You can find lots of free Fair Isles pattern online. Be sure to check out Pinterest and Raverly for patterns and ideas. Tapestry crochet is used to produce very colorful and bold designs. Many of the designs used in Tapestry crochet have their roots in Native American and South American designs. The use of bright bold colors and intricate designs make Tapestry crochet one of the most fun techniques you can learn. Unlike Intarsia where you drop and pick up colors as you need them, and Fair Isle in which the colors are stranded on the wrong side of the fabric, color work in Tapestry crochet is achieved by carrying the unused colors inside of the active stitches. Since you carry the unused colors in the stitches, you would normally not use more than two or three at once to prevent the stitches from becoming bulky and looking bad. It is normal for the unused color to peek through the active row, this adds to the interest and beauty of the technique. You can find hundreds of free charts for Tapestry color work, as well as written patterns online. Check out Pinterest or Raverly to see how many choices you have and pick a few easy ones to start out with. In this chapter we’ll learn the basics of Tapestry crochet and practice a few easy charts so you can get this fun and colorful technique down. As you work you will carry both strands of yarn across the row. The unused yarn lays on top of the previous row and is encased into the stitches of the active color. When it is time to change colors, work the last stitch of the color until you have two loops on the hook. Pull the new color through those two loops and let the old color rest on top of the stitches of the previous row and encase them in the stitches of the new color. As you need a color you pick it up and pull it through the last two loops of the last stitch and then encase it into the stitches. At the end of a row capture the unused color under the first chain stitch of the row and then continue to work in the Tapestry technique across the row. Colors are carried up the sides of your work and change as needed. In this example you can see the yellow yarn is encased in the stitches of the purple yarn, and vice a versa. The fabric produced is a bit thick and dense and is a great choice for purses, bags, home décor items, and blankets. The following example is crocheted from the chart below the image. You can see how the unused yarn peeks through the rows giving the sample an almost Native American feel to it. Tapestry charts are read like all other types of charts; odd rows from right to left, and even rows from left to right. If you are working in the round, then you would read each row from right to left since you will not be turning your work. High contrast color combinations are normally used in Tapestry crochet, but you could use colors closer in shade and tint for a more subdued look. A search online will yield many pretty design charts from very simple to quite complex. Now that we’ve learned some of the basic color work techniques it is time to move onto color stitch patterns. In this chapter I’ll share with you some of my favorite go-to stitch patterns when working with color. These are stitch patterns you can incorporate into your own creations and patterns. I hope you enjoy learning them. When you are working with stitch patterns you will see directions such as chain sets of 4 plus 3. What this means is the chains in the foundation chain need to be divisible by 4; 8, 12, 16, 20, 24, and so on. Once you have a number which can be divided by 4 crocheted, add 3 more chain stitches for the complete foundation chain. This pretty stitch pattern creates blocks of intersecting colors in your project. It is perfect for afghans, dishcloths, hats, bags, and many other projects. You will need to know how to chain, single crochet, and double crochet. The pattern is worked in sets of 6 plus 5. For this example I have chained 29 (4 sets of 6 plus 5). Repeat Rows 2 & 3 alternating colors carrying them up the side of the fabric until you reach the desired length. This pattern creates pretty waves in your crochet fabric. Use it to create a vibrant color scheme with contrasting colors and black, or a soothing one with pastels and white. You will need to know how to chain stitch, single crochet, half double crochet, double crochet, and treble crochet. This pattern is worked in sets of 10 plus 2. For this example I have chained 32 plus 2 (3 sets of 10 plus 2). Repeat Rows 2-6 until desired length carrying colors up the side of the fabric. This stitch pattern creates a stunning houndstooth effect. Use contrasting colors to really make the color pop, or use colors in the same color family for a subtler effect. You will need to know how to chain, single crochet, half double crochet, double crochet, and treble crochet. This pattern is worked in sets of 4. For this example I chained 24. Repeat Rows 2 & 3 until desired length, alternating colors every 2 rows. This is a very easy stitch, but it produces pretty diamonds in the crochet fabric. You will need to know how to chain and double crochet. Pattern is worked in sets of 2 plus 1. For this example I have chained 21. Repeat Rows 2 & 3 alternating colors as you like until desired length. My mother and grandmother made afghans out of this stitch with their scraps of yarn in their stashes. The result is a colorful and bright afghan that is nice and dense. You can use all sorts of colors, or decide upon a coordinated color scheme. You will need to know how to chain and half double crochet. This pattern is worked in sets of 3 plus 3. For this example I have chained 24. Repeat Row 2 changing colors as you like until you reach the desired length. 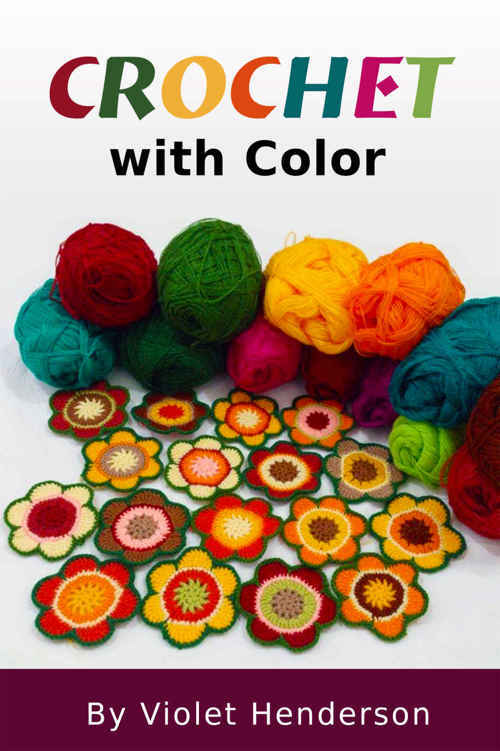 Thank you so much for purchasing this book on crocheting with color. I hope it has helped you understand how colors work together and helps you choose the colors for your projects. I also hope it has given you the basic skills needed to further explore color stitch patterns. Remember to have fun with color and keep on hooking!